The First Strike DLC pack for Call of Duty: Black Ops that went live for the XBox 360 earlier this month will soon be coming to the PC and PlayStation 3. First Strike was announced as a "timed exclusive" for the Xbox 360 back in December, meaning that 360 owners would be able to tear into the map pack on February 1 while those of us with PCs and PS3s would have to wait. How long? Nobody knew! But now we know. 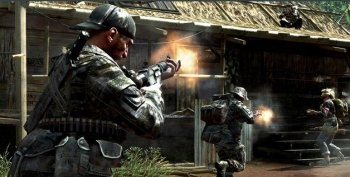 As part of its Calendar Year 2010 Financial Report, Activision revealed that the First Strike DLC would be released for the PlayStation 3 on March 3 and come to the PC "later in the quarter." It also said that First Strike had done remarkably well on Xbox Live, setting a new record with 1.4 million downloads in its first 24 hours of release despite costing a whopping 1200 Microsoft Points, which translates into $15. The mark is more than 25 percent higher than that set by last year's Call of Duty: Modern Warfare 2 Stimulus Package. With that question settled, only one remains: will PC and PS3 owners be willing to fork over 15 bucks for five maps? It seems like an awfully stiff price tag to me, but 1.4 million 360 owners can't be wrong. Right?